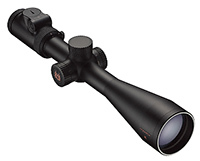 MONARCH 7 IL is the peak of perfection in Nikons riflescope evolution. The field of view is outstanding in width, resolution and brilliance. The 1-4x24 ZR is equipped with a rail for ringless rail mounts. Fully multicoated lenses maximize light transmission. Images are not only bright and crystal clear, but also well balanced in colour. Durability is ensured by the etched glass reticle and the solid, one-piece 30 mm tube. Quick-focus eyepiece that ensures long eye relief makes accurate targeting easy throughout the magnification range. Windage and elevation adjustments feature an instant zero reset function. The brightness of the illuminated reticle can be adjusted in 32 gradual increments.